In the third week of December the Victorian Civil and Administrative Tribunal (VCAT) brought down its interim decision on the action from the site owner to remove or vary the covenants at 1-7 Waterfront Place community centre. BCNA and Save Port Melbourne Gateway objected to the action but VCAT decided in favour of the owner that it would allow variation to the covenants for a building up to 10 storey in line with Planning Scheme Amendment C104. This Amendment is awaiting final decision between the Department of Planning and the City of Port Phillip. Discussions are also taking place to protect the pathway and bike trail from overshadowing at the winter solstice. Further information will be posted when it becomes available. The final Port of Melbourne works update for 2014 can be downloaded here. We wish you a happy and safe Christmas and thank you for your patience and support during the year. In preparation for the use of the soccer facility at JL Murphy Reserve for the 2015 Asian Cup, local residents will be receiving the notification (download here) letter this afternoon. Please pass on via your networks also. It is still confidential who will be training at the grounds, but will let you know when I can. Just to let you know that for some reason Council doesn't have accurate data on the number of times and people that have raised this intersection as a community concern for safety. Can I encourage you and and your groups to pass this message on and ask that anyone who agrees and feels strongly to let me know about it.? On behalf of the BCNA Committee we wish you the compliments of the festive season and thank all members for their contribution and support over a very eventful year. You will note we have updated the appearance of the BCNA website and we will keep you posted with regular news events in the new year. We have also recently loaded a lot of new information to the website so click here to check it out. We are going to head south from the Port Melbourne Yacht Club to meet up with 3205 BeachPatrol South Melbourne coming north to have a joint cuppa with them. This venue was the location for one of our most memorable earlier dinners as we watched the ships passing up and down the river at sunset. As usual we will start at 7:00 for 7:30 pm and the price is $50 per person cash as we enter (a gold coin for tips will be appreciated also). There will be a cash bar for drinks. The menu (click here to see it) allows for a variety of options, starting with tapas and concluding with a dessert and tea or coffee. If any members wish to receive a ride to the restaurant then please advise me and we will arrange transport. Please also invite your neighbours and any newcomers to your area. It promises to be a great start to the festive season. The President's Report has just been published. Click here to download it. There will be refreshments provided before the Meeting and guests to help explain to members what is happening next to us in the new Fisherman's Bend development. An update on BCNA activities will be provided by the President. The annual elections for office bearers and committee will be determined at the meeting – please fill in the nomination form as new committee members are always welcome. Your Committee encourages you to participate on the evening. Click here to download the formal notice of meeting. The Port of Melbourne Corporation (PoMC) is preparing for the 2014/2015 Cruise season at Station Pier starting in late September. One of their issues is the effectiveness of the street signs placed at the entrances to Beach Street and Waterfront Place warning of heavy congestion on turnaround days and double sailings. As BCNA sought these warning notices some years ago we are asked whether community members see these as being helpful or, as some have reported, unhelpful as they could be confusing or a distraction for drivers. PoMC would like to do away with the signs and BCNA is asking what the opinions of the local community are. Please advise over the next 7 days either continue or OK to remove. We will pass on the responses to PoMC. The cost is $50 per person plus a gold coin gratuity (paid in cash on entry). Drinks are available as normal from a cash bar. Please RSVP by Tuesday 5 August to tmnink@bigpond.net.au. Please advise in advance if you have a vegetarian preference. It should be another great evening of fellowship. We look forward to catching up on 12 August. Book in yourselves, your neighbours or new arrivals to the neighbourhood. Today we received the following information from Sandridge Ward Councillor, Bernadene Voss. Please be aware of the lowering of speed limits! You may have noticed them.... You may have seen they are still covered up ... But very shortly... Shoppers, residents and visitors to the Bay Street shopping strip are safer thanks to a reduction in the speed limit. Between 8am and midnight, the speed limit will be lowered from 60 to 40 km/h between Beach and Raglan streets. VicRoads expect the electronic signs for the reduced speed limit will beswitched on by the end of July. The City of Port Phillip has lobbied VicRoads and the State Government for several years to reduce the speed limit in Bay Street. Its successful implementation is testament to the continued pressure and persistence of Council officers and the community. The 40 km/h speed limit in Bay Street now falls in line with other shopping strips throughout Melbourne.Lowering speed reduces the likelihood and severity of crashes, especially to those most vulnerable, and encourages more walking and cycling, which enhances the vibrancy of the shopping strip. Our event is registered to coincide with the Melbourne Sustainability Festival to raise awareness to the issue of beach litter and plastic waste. This festival presents a number of interesting speakers/movies on several aspects of environmentalism and sustainable living. Numerous stalls will be present for business offering more sustainable products. 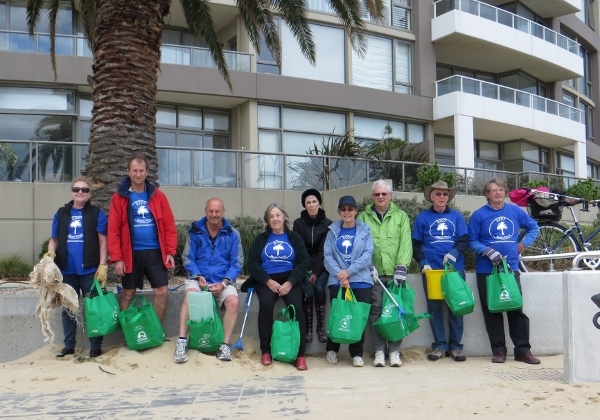 Thanks for coming out last weekend to help keep our beaches clean. Thanks to those that were able to come out and clean the Sandridge beach last Saturday. The beach and the grass & tree area behind it were quite trashed by litter. We had about 20 volunteers turn up and they picked up approx. 2-1/2 of the green bags each during one hour. These hot days bring out the litterers unfortunately.